books | Exciting Adventures of an ex-Archaeologist, soon to be Teacher! Access to archaeological journals, or, how to spend £350 quite quickly. I read a news article the other day which pondered why Harry Potter didn’t just use Google. The book was published in 1997, so presumably written a few years before that. The article asks why, when faced with a search for some information, Harry had to struggle through the library to find a book. Now, I’ve never read the Potter books so i have no idea how arduous a task this was but I get the impression death and disaster were imminent. The author of the article suggests that younger Potter readers, brought up in the information age, would google what Harry needed rather than have to go through the library trauma in the first place. The point is that Hogwarts wouldn’t have had internet access in that day and age and that Google didn’t really take off until the year after the book came out. What does this have to do with archaeology journals? Well, I miss my equivalent of Hogwarts library. Yes, I have a very good ‘local’ library (National library of Scotland) and am also a member of the National Museums Research Library and can borrow books and journals from both. I also have excellent broadband at home so the world of archaeological research should be mine for the taking. But it isn’t. Without the backup of institutional subscriptions many journals are out of my reach. I’m not the first person to realise this but work at the day job has recently made me more aware than ever of what I could be missing out on. Spending the last few weeks reviewing bibliographies, checking for misplaced commas and references for thousands of entries, I have had my eyes opened to the many and varied sources used for discussing archaeology in Scotland today. There are the usual suspects one might expect (Proceedings of the Society of Antiquaries of Scotland, Antiquity etc) as well as more specialised reading and some rare gems – mostly local history society transactions and self published monographs. Most of them are subscription only, not as many are open access. Although this situation might be changing for some (find a very good list here) it is unrealistic to expect that verything will become free to view, nor should it – journals cost money to produce and will always need people to work on them. Obviously, there is a difference here between leviathans of publishing such as Elsevier making millions and smaller more independant publications who are still peer reviewed and of excellent quality but who barely make a profit. Arguably, if it wasn’t for the whole impact factor issue more journals could afford to be open and reach more people, I could go on. I guess if i didn’t want to broaden my mind, keep up to date with archaeological goings on and think about future jobs and maybe post docs I could just not subscribe at all, but where would the fun be in that? Archaeology is becoming a decreasingly viable option as a career. Given point 1, temping is not a bad idea. Temping in an office means you are always near a kettle and get to wear nice shoes. 6. Nigella Kitchen is an awesome book and definitely a must have. Waterstones have an awesome half price offer on some ‘celebrity books’ just now, which happily for me includes the new Nigella. Simply entitled ‘Kitchen‘ (http://www.nigella.com/books/view/kitchen-33). I like it for the recipes, of which 95% seem to be new for Nigella and aren’t in the other books of hers I have and Andy is loving it for the pictures of her cooking. Emphasis on the ‘her’ there. I’ve already tried the banana/cherry/coconut loaf and it was melt in the mouthy. Very similar to my usual banana bread recipe but the coconut added a nice sweetness and texture. After the relative £13 splurge on that, the next cookbook came from a Lothian Road charity shop. The classic ‘Austrian Cooking‘ by Gretel Beer (read her interesting obituary here) – published 1954. Largely about pastries and pigs knuckles.You can’t even attempt a recipe from it without stocking up on lard, cream and rum first of all so I can’t wait to try it out at the weekend. It also includes handy austrian cookery tips, so if you didn’t know already; “remember that brushing pastries with rum before deep frying will help stop them absorbing too much fat”. Rum and pastries and deep frying – lucky for this cookbook that it ended up in Scotland! I’ll post details/pics from any related cooking experiments when they happen – yum! LibraryThing.com has stolen my Saturday afternoon. I guess the first question is why would you catalog your books? You aren’t a library! No, but I’ve always loved books but what with the transient lifestyle Archaeology so often forces upon you, having a good stock of them isn’t conducive to moving house every few months. Now that we will be in Edinburgh for a few years (hopefully!) we can once again pile the bookshelves and worry about the moving van when I’m well into my thirties. Its easy peasy too – just enter the ISBN or author or title and Librarything searches Amazon, the Library of Congress and a whole bunch of other libraries to get the metadata for you. There is also a manual option, handy for those old and antiquarian books we’ve acquired. I particularly like seeing what other books people have. Maybe it is just nosy, or a form of book stalking, but there is something friendly about it. For example, over 9000 people also have The Girl with the Dragon Tattoo, but only 5 other people have my Pottery in Anglo Saxon England shire publication. Maybe those 5 folk have interesting books on their list I could seek out? It is also free, well, free for your first 200 books. After that you can make a paypal donation of any amount over $19 for lifetime membership and adding an unlimited number of tomes. Unlimited books. Bring it on! I’ve picked up a load of good books in charity shops lately, many of them cookery and baking based. The National Trust Book of Traditional Puddings (1983) is one of them. A lot of the recipes are labour intensive or designed for large families (I don’t think the two of us could manage some of them even if we tried), so for the Saturday Experiment I choose one if the many ice cream recipes. 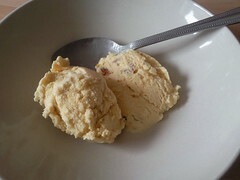 In the freezer is a Marmalade ice cream – consisting of eggs, lemon juice, cream, sugar and marmalade. It’ll be a few hours before its ready but looks like it’ll be worth it. You basically whisk 4 egg yolks with a tablespoon of lemon juice, add 4 tablespoons of marmalade, then 400ml of whisked double cream. Add sugar to taste, depending on how sweet the marmalade was in the first place. Fold in the egg whites that you’ve just whisked to the soft peak stage and freeze in a lidded container. Take out of the freezer every so often and mush it about with a fork to break up any ice crystals. Yummy! Instructions: 1) Look at the list and make those you have read bold. 2) Star (*) the ones you LOVE. 3) Italicize those you plan on reading. Unsurprisingly, my bookshelf so far looks like a Roman archaeology geek 😦 See for yourself in my sidebar!